Tetracycline is a powerful antibiotic that kills a wide variety of bacteria. But if it’s taken while teeth are forming, tetracycline will deposit in the enamel and the dentin of the teeth. The result is permanent gray or brown stains that are deeply embedded in the teeth. Sometimes the discoloration in the teeth is uniform, but the discoloration can vary. At times there are dark horizontal bands of discoloration on the teeth that vary in intensity. 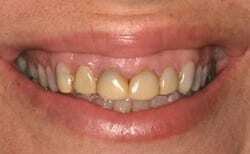 Tetracycline stains can cause you to hide your smile, or to be embarrassed to smile. The stains cannot be removed by professional dental cleaning, by over-the counter whitening strips, or by typical teeth whitening treatments. But there is effective treatment available from cosmetic dentist and accreditation candidate Dr. Duane Delaune. Porcelain veneers are thin wafers of porcelain that are bonded to your teeth. Porcelain veneers can cover tetracycline stains and give you a beautiful smile makeover. They are the best choice for treating the stains, and they correct many other problems with teeth such as gaps, cracks or uneven teeth. But to effectively cover the stains, the porcelain veneers must be made with the correct translucency, color and opacity. Otherwise, the dark stains will show through the veneers, or you may end up with teeth that have a pasty color and don’t look natural. You’ll also want your gums to look natural between your teeth. 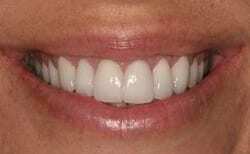 Dr. Delaune has mastered the techniques required to cover tetracycline stains with porcelain veneers and give you a beautiful, natural-looking smile makeover. In the before picture below, you see teeth that were treated with dental bonding by a general dentist who didn’t understand translucency and color. The stains showed through the bonding. Dr. Delaune used his expertise in cosmetic dentistry and porcelain veneers to beautifully transform this patient’s smile.